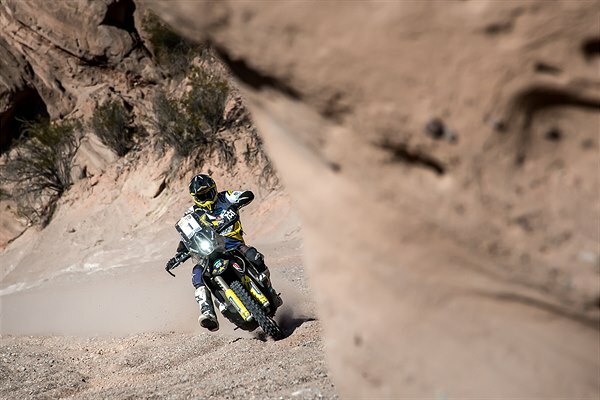 Powering through a challenging penultimate stage of the Desafio Ruta 40, Pablo Quintanilla is currently fourth in the event’s provisional overall standings, a mere seven seconds behind the rider placed in third. Looking to take his FR 450 Rally machine to the finish of the gruelling week-long event, the Rockstar Energy Husqvarna Factory Racing rider has his eyes set on securing as many points as possible for the 2018 FIM Cross-Country Rallies World Championship. Day four of this year’s Desafio Ruta 40 brought another long and demanding stage. Featuring some fast sections and tricky navigation, the day’s timed special included lots of dry and stony rios. Suffering an early fall, Pablo Quintanilla opted not to take any more risks. Enjoying a steady pace aboard his Husqvarna from then on, the Chilean rally star secured a fifth-place result for the day. Failing to finish outside the top-five in any of the stages contested so far in the Argentinean countryside, Pablo is currently fourth in the rally’s provisional overall standings. With one more big stage left to run, Pablo will give his best to earn a spot on the vent’s final podium. Tomorrow’s fifth and final stage at the Desafio Ruta 40 includes a 200km timed special in a total distance of 447km. Starting from Villa Unión, the race will finish in San Juan. Download high-res images from the 2018 Desafio Ruta Rally here.